Several months ago I made a “Pistachio Petit-Four” layer cake from a favorite blogger. Everyone loved it. Those who weren’t around for a bite, hated it (and me) because of the obnoxious check-out-how-good-this-looks (and you can’t have any) pictures I was sending over from my phone in between bites. Sorry brother. Though sometimes I enjoy this torture, sometimes I wish I could deliver a piece straight to their door. A few days ago, that’s exactly what I did with these. 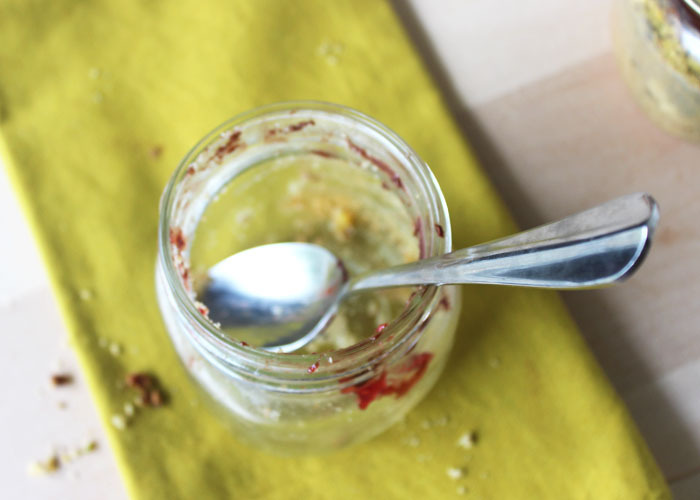 This simplified version of that same pistachio cake made it perfectly through the mail in half-pint mason jars. 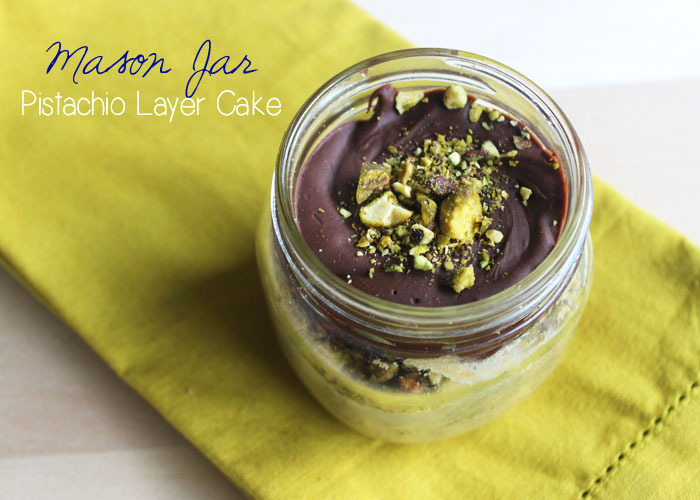 The bottom and largest layer is an almost bread-like pistachio cake baked directly in the jar. Then I added a layer of chopped/toasted pistachios and raspberry preserves. The final topping is a simple chocolate ganache that gets poured over while warm and slowly hardens as it cools to hold everything else in place. Tip: Start saving the packing material from any boxes you’ve received in the mail and re-use it to separate and secure the jars here. I also requested that the post office put “fragile” stamps on the box. Makes 12-16 half pint jars. Preheat oven to 325 degrees Fahrenheit. Spread pistachios out on baking sheet and lightly toast for 8-12 minutes. Remove nuts from oven and allow to cool. Lightly grease inside of mason jars with extra butter or cooking spray. Place jars 1-2 inches apart on baking sheets and set aside. Finely chop toasted pistachios and set aside 3/4 cup. Put remaining 1/2 cup of pistachios in a food processor with sugar and pulse until finely ground. Pour processed sugar and pistachio into a large mixing bowl. Add flour, baking powder and salt. Use a mixer to blend on low for 30 seconds. Add softened butter, milk and vanilla. Mix on low until completely incorporated with dry ingredients. Increase speed to medium and beat mixture until light and fluffy or around 2-3 minutes. Begin slowly adding beaten eggs, scraping the bowl down between additions. Spoon batter into greased mason jars filling no more than 1/3 of the jar. Place trays with mason jars in oven and bake for 25-35 minutes or until a toothpick inserted in the center comes out clean. Once mason jar cakes are ready, remove from oven and allow to cool completely. 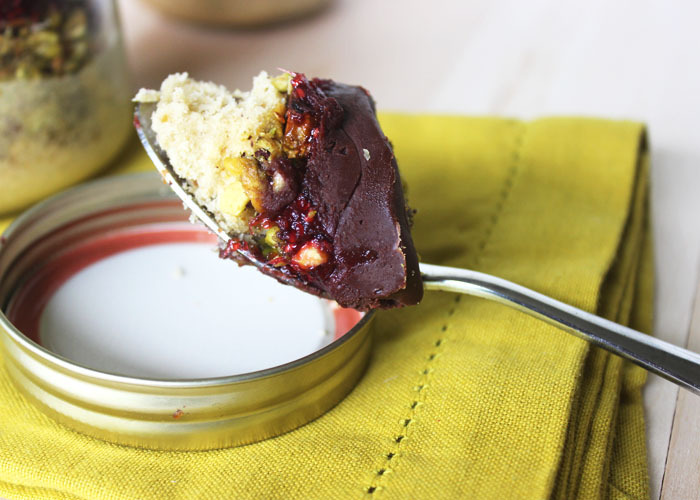 Top each cake with a thin layer of chopped pistachios and around 1 tbsp of raspberry preserves. To prepare the chocolate ganache topping, place chocolate chips in a heat safe bowl. Heat heavy whipping cream in a saucepan over medium heat until simmering. Pour over chocolate chips and let sit for 5 minutes. Whisk until smooth and slightly thickened. 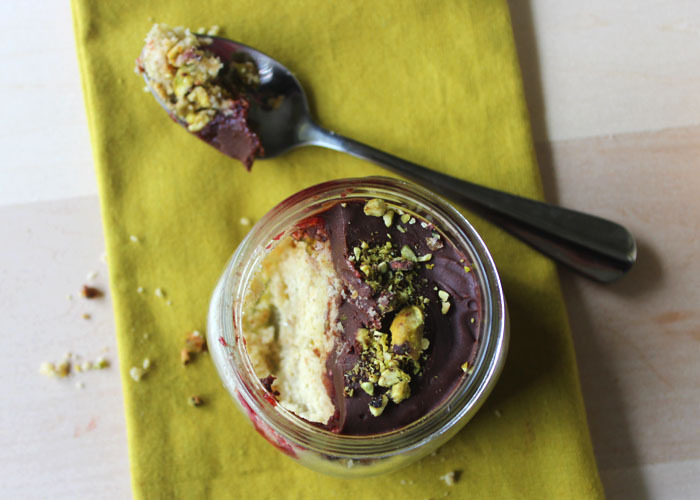 Pour ganache over raspberry layer of each cake and garnish with any leftover pistachio pieces. Allow to cool completely before tightly twisting the lid on each jar. Delicious, yummy yum yum. Just had one, can’t wait for the other one. Thanks again. Glad to hear you enjoyed it, Kosta! I did, but I have to give #2, Maria (my sis) is hinting that she wants it. Oh well. PS. Maybe you can send me 2 more later on? I didn’t see at what temperature we are supposed to bake it. Glad you found it Mary! Let us know how it turns out!